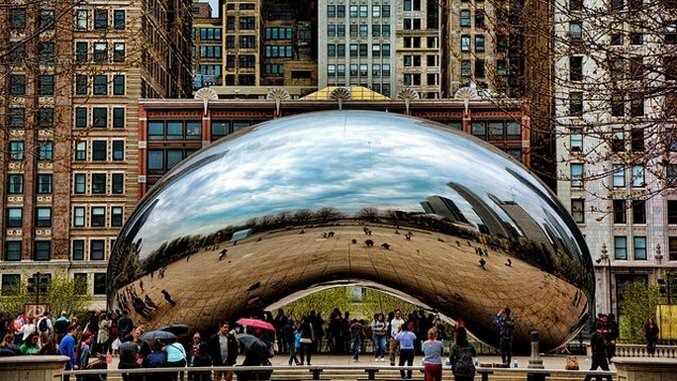 Photo by Mariano Mantel, CC BY-NC 2.0 Chicago is home to the country's first public outdoor artwork by Indian-born British-artist Anish Kapoor. Officially titled Cloud Gate, but known lovingly as the Bean, this 110-ton sculpture sits in AT&T Plaza at Millennium Park between Lake Michigan and Grant Park. It's comprised of 168 polished stainless steel plates that are completely seamless. Kapoor describes the sculpture as being inspired by liquid mercury. Cloud Gate reflects and distorts the surrounding city skyline and the sculpture's spectators. It also has a 12-foot high concave chamber that visitors can walk beneath it. Cloud Gate was completed in 2006 and has since become one of Chicago's most popular tourist attractions and landmarks. Photo by Vincent Desjardins, CC BY 2.0 Alexander Calder's Flamingo stands both in contrast to and harmony with the three Ludwig Mies van der Rohe-designed buildings it's surrounded by in Federal Plaza at 50 W. Adams St. The 53-foot-tall freestanding abstract sculpture features curved steel in "Calder Red," which pops against the black Bauhaus-style building surrounding it. The sculpture was commissioned by the U.S. General Services Administration and completed in 1974. Calder's original maquette of Flamingo is on display at the Art Institute of Chicago in its Modern Wing. Photo by Shutter Runner, CC BY-NC 2.0 Magdalena Abakanowicz's Agora features 106 headless figures made of cast iron that stand in Chicago's Grant Park. Agora, which comes from the Greek word for gathering place, invites spectators to walk among the crowd of 9-foot tall sculptures and observe them up close. Agora arrived in Chicago on permanent loan from the Polish Ministry of Culture 2006 and remains the late artist's largest permanent installation. Photo by Christopher, CC BY-NC-ND 2.0 By far one of Chicago's most playful works of public art is Jaume Plensa's Crown Fountain. Located in Millennium Park since 2004, the interactive video sculpture is comprised of two 50-foot-tall glass block towers set in a shallow pool. The towers include LED screens that feature moving images of some 1,000 diverse Chicago residents, some of which open their mouths to spit water out onto the crowd of spectators that regularly gather to play in the pool on warm-weather days. Photo by Phil Roeder, CC BY 2.0 The untitled sculpture by Pablo Picasso, known locally as simply the Picasso, stands at 50 feet fall within Daley Plaza at 50 W. Washington St. in Chicago's Loop neighborhood. When it was unveiled in 1967, it was the city's first significant public artwork and has since become a Chicago icon. Photo by Timothy Neesam, CC BY-ND 2.0 In 1981, artist Joan Miro unveiled a commissioned public artwork named after the city it calls home, although it was originally named the Sun, the Moon and One Star. The Chicago sculpture is located in Brunswick Plaza directly south of the Daley Center and not far from the Picasso. It stands at 39 feet tall and is made of steel, bronze, concrete, ceramic tile and wire mesh. Photo by Jeremy Thompson, CC BY 2.0 Standing in front of the equally artistic and modern Helmut Jahn-designed James R. Thompson Center in Chicago's Loop neighborhood at 100 W. Randolph St., you'll find Jean Dubuffet's Monument with Standing Beast. The 29-foot sculpture is based on the artist's series of paintings titled Hourioupe. The sculpture was commissioned by the Capital Development Board of Illinois and since its unveiling in 1984 has been interpreted as a variety of things and loving known by locals as Snoopy in a blender. It weighs in at 20,000 pounds and is one of only three Dubuffet monumental sculpture commissions in the country. Photo by JR P, CC BY-NC 2.0 Marc Chagall's Four Seasons boldly sits on display at 10 S. Dearborn St. outside Chase Tower. It has called the plaza home since its unveiling in 1974. The mosaic artwork stretches across all four sides of a rectangular box that measures in at 70 feet long and 14 feet high. It depicts six scenes inspired by the city and includes hundreds of colors and thousands of individual pieces. Chicago is home to multiple art museums featuring world-renowned works, but some of the city’s most notable pieces are not confined within the walls of any building. Rather, the city itself serves as an open-air museum where a variety of public artworks are on display and scattered amongst Chicago’s parks and plazas. Summer is the perfect season to explore the city’s free art, which includes works by Pablo Picasso, Anish Kapoor and Marc Chagall, to name a few. This week’s Bucket List is your guide to exploring Chicago’s outdoor public art from Cloud Gate to the Flamingo.